This is an authentic, antique map of what is now the southeastern United States with part of Texas, Mexico, Cuba, the Bahamas and the Gulf of Mexico. The map was published by Cornelis van Wytfliet as part of Descriptionis Ptolemaicae Augmentum, out of Leuven, Belgium in 1597. 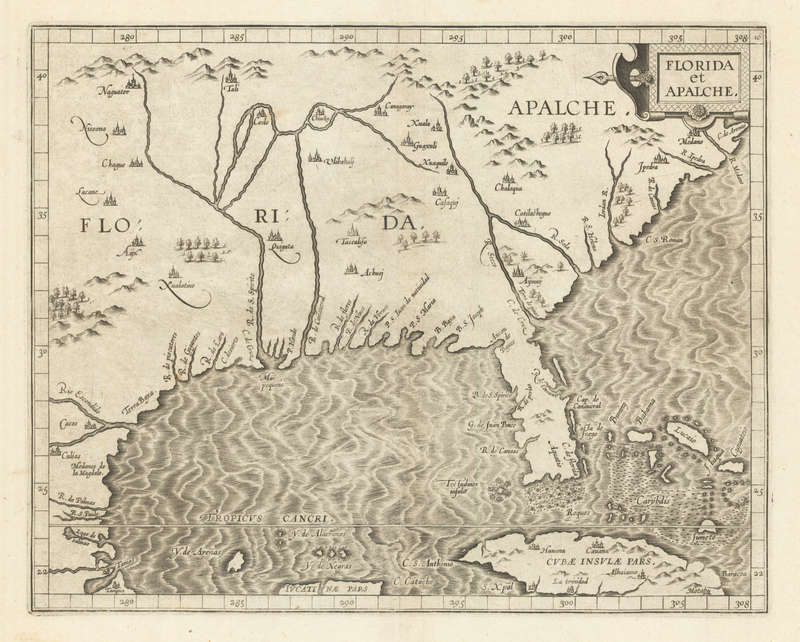 This important map is one of the earliest maps to focus on the region and the second to name “Florida.” Inland detail is sparse, save for a few place names, mountains, forests, and river systems. Most of the information is derived from the Spanish explorations of Hernando de Soto, Cabeza de Vaca, and Moscoso. It is largely based on the Ortelius/Chaves map of 1584, but expanded to include parts of Cuba and the Bahamas and further north to show the territory of the legendary Apalche. Condition: This map is in A+ condition with full margins and a very strong impression.